Buy, Rent or Skip Fast and Furious 6? After the onslaught of Fast 5, I was very much looking forward to Fast and Furious 6. I'm surprised that I had the patience to wait it out and sit by and wait my turn for it to arrive at my Library and it was definitely worth the wait. That's a lot of 'waits' in one sentence!! If anyone read my initial review for Fast 5, you know it had a lot going for it and I stand by my word that that installment is without a doubt the high point for the series. That doesn't lessen anything that takes place in Fast and Furious 6 though. It's not even really the same type of movie whereas the former was a straight up Heist flick and Furious 6 is more of a chase flick, harking back to what initially made the series what it was. I will say that Furious 6 is definitely runner up for best in the series and I'm glad they brought back Letty (Michelle Rodriguez) as it gave Dom (Vin Diesel) something worth fighting for. There's a lot of overblown (i.e. awesome stuntwork to be found here) and one of the best moments in the film takes place between the two when Dom throws himself off his car to save Letty in midair. Yes, you can say it was a 'Jump the shark' moment. But still damn cool to see play out. End of story. 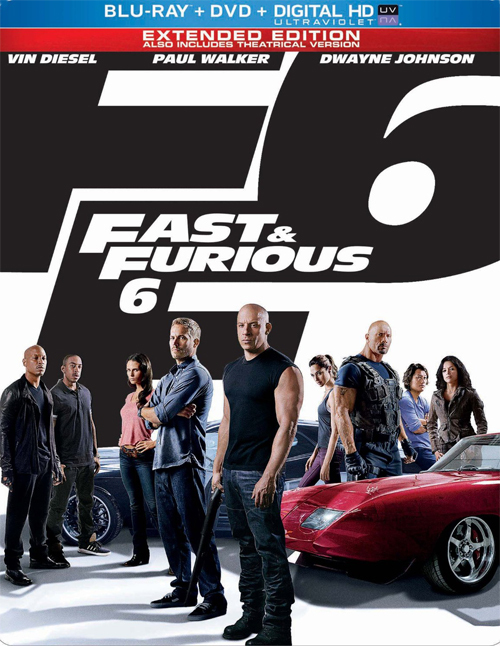 As with Fast 5, the entire crew returns, featuring Paul Walker, Jordana Brewster, Tyrese Gibson, Chris 'Ludacris' Bridges, Sung Kang, Gal Gadot and Dwayne Johnson with newcomer Gina Carano. Be sure to stick around to mid end credits for a cameo by Jason Statham that sets up Furious 7. With each successive installment in the series, I've been wondering when they would tie the events of the series directly to the events that take place in The Fast and the Furious: Tokyo Drift. That wait is finally over. This of course means that Lucas Black will finally join the rest of the crew in Furious 7. As much as I'm looking forward to seeing Furious 7, there is a dark cloud hanging over it and my enthusiasm is kind of tempered because of it. Anyway, Furious 6 is definitely going to be added to my personal DVD Library. A must-Buy for me and everyone else. Hey Mac, can you copy/paste your review for the movie here? I had to skip it due to potential spoilers in your review. Very much want to read it now. Thanks. Anyone else think that the runway was ridiculously long? There isn't an airport anywhere in the world that has a runway that takes 15-20 minutes to cover from end to end. But still an awesome stunt piece none the less. The runway scene has been pretty well scrutinized, down to a nerdy calculation. That's one of those things ya just gotta say f uck it.